1) Connect More With Other Bloggers – I’ve made so many new friends and I’ve started reading SO many more blogs since Megan and I debuted 5 Fandom Friday and it’s made me love this ever expanding community to pieces. I really look forward to seeing what other people post and while I don’t get to comment on everything (especially if I’m reading at work), I want to make more of an effort to email myself a reminder to comment later on posts I really enjoyed so other people know that I appreciate what they’re putting out there. 2) Take Better Photos – I must’ve been a good girl this year because Santa blew my mind when he brought me the Canon Rebel that I’ve been DYING to own (I even wrote about it on a previous 5 Fandom Friday post!). I feel like I’ve come such a long way with photographs (I actually cringe when I look at some of the first things I posted on this site), and photography has become an activity that I really enjoy. It’s almost therapeutic in a sense. I want to continue improving my skills and I may even look into some courses on my camera so I’m getting the most out of it that I possibly can. 3) More Bookish Posts – One of the reasons I’ve been more absent from social media in the past few months is because I cannot stop reading! I’ve been really into as much YA lit as I can get my hands on and I’m really looking forward to sharing more recommendations, book hauls, and just generally bookish posts on this space. I may even add in a YouTube component for reviewing things since Andrew and I have acquired some fancy lighting equipment and microphone recently. Here’s the end of the year book survey I recently filled out! 4) Host More Giveaways – I’ve hosted quite a number of giveaways over on Wear Pink Wednesdays, but I really want to offer more to my readers here and I think one of the best ways to do that is by hosting giveaways. I’ve worked with companies such as WeLoveFine, QuirkBooks, Sideshow Collectibles, Big Honcho Media, and several comic book publishers in the past and I’m really looking forward to branching out and partnering with more companies in the future! 5) Utilize Editorial Calendar – I always feel like I can’t post more than one thing per day and I have no idea why I’ve mentally set this restriction for myself. It’s led to me not getting to post about certain events until much later, or even at all in some cases, and then I feel bad that I’ve already put in the effort for an unpublished post. I’m going to start utilizing my Flashback Adventures tag much more so I can catch up on some missed events. I hope you had a nice Holiday! It looks like a few of us had giveaways listed! I can’t wait to see what everyone comes up with! I feel ya on 1 and 5! 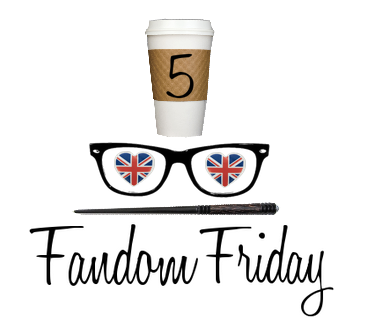 Happy Holidays and I’m so excited that Five Fandom Friday is a “thing” now!!! FOREVER! I took a holiday too, so I missed this week’s Fandom Friday, but I’ve loved reading people’s goals.